You are here: Home / Blog / Faith & Family / GREATER in Theaters August 26th! GREATER in Theaters August 26th! The wait is over, the movie GREATER will be in theaters on August 26th. 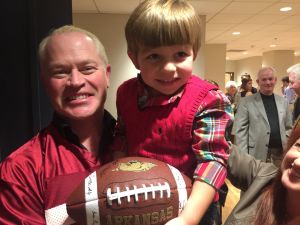 As many of you are already aware, my son Spencer has a role in the movie, he plays Aaron Burlsworth. Donna and I have actually seen the movie at it’s premier in Little Rock last year but due to some last minute opportunities that allowed the film to be marketed to a much larger audience, so the launch was delayed. You’ll just have to take my word for it, the movie is incredible, here’s a review I did after seeing the film.